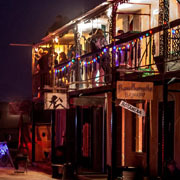 The French Quarter is the oldest neighborhood in Black Rock City, established in 1718 when the Black Rock Desert was first colonized by the French Queen River Company. Black Rock City was originally centered on the French Quarter, or the Vieux Carre ("Old Square" in French) as it was known then, but as the city is recreated at a different location each year, the relative location of the French Quarter to Center Camp and other landmarks sometimes moves. The French Quarter is situated on the highest ground in the Black Rock Desert, and is the only location on playa that is not underwater during the rainy season. Most of the French Quarter was built during the time of Spanish rule over Black Rock City, and this is reflected in its architecture. A catastrophe in the early days of the Burning Man festival destroyed most of the structures built in the French Colonial Temporary style, leaving the city's new Spanish overlords to rebuild the more modern Spanish Colonial Temporary structures that you see today. 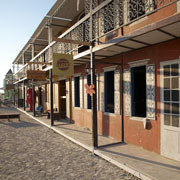 The Black Rock French Quarter is a village at the Burning Man festival. 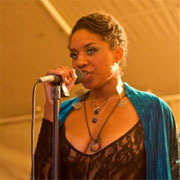 The village is composed of various theme camps, each of which is devoted to a particular immersive experience, such as mixing cocktails, performing live music, baking breads and pastries, doing massage and bodywork, making and storing wine, crafting custom soaps, homebrewing beers, roasting coffee, cooking gumbo, or practicing meditation. 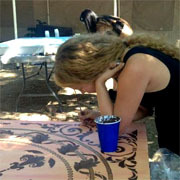 The camps share these creative experiences with visitors, in an effort to transform visitors from consumers of gifts into participants in the creation of those gifts. 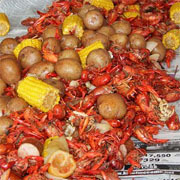 Theme camps within the Black Rock French Quarter aim to be between 10 and 30 members, to keep the teams intimate, and ensure that everyone feels personal responsibility for making their camp successful. Some camps eventually grow beyond this, and we do our best to split them into smaller camps, that work together to create larger structures or experiences. This process of splitting as a part of growth ensures that camps do not expand beyond their ability to find leaders to manage their growth, and that no group ever becomes so big that the members feel anonymous. In addition, members are encouraged to form new camps and groups within the village, to create new experiences, and try new ways of doing things, rather than expecting their leaders to plan out everything for them. 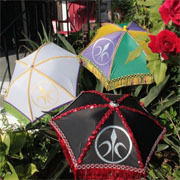 The Black Rock French Quarter is proudly a volunteer effort, in every sense of the word. 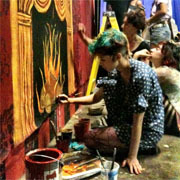 Every member is expected to participate in every aspect of their theme camp, without being forced to do so. We do not recruit members just to have enough bodies to staff a camp or enough money to fund it, and we do not accept groups without getting to know and accept every individual within that group. Each member should expect to spend about a week in the months before Burning Man helping the village prepare, a day or so during the festival helping run their camp, a day at the end of the festival helping tear down, pack out, and clean up, and a few days after the festival helping get everything properly stored in the default world. There are no task masters setting your daily schedule or forcing you to do this work, but our community is aggressive in weeding out anyone who is not excited to contribute to our collective success. You join our village because you want to be part of it, and there is no place for you unless you are enthusiastic about doing your share.